This simple recipe is perfect for a night that you want to cook something nice in a short time. 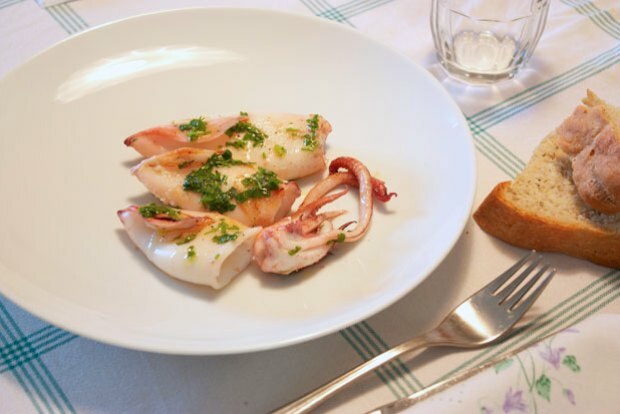 For the simplicity that characterizes this dish, it is necessary that the squid is very fresh. This plate can be served simply with a fresh salad. Heat up a non-stick grill pan over high heat. After 5 minutes check that it is hot. While the grill pan is heating thoroughly, wash and dry the squid. Lay the squid in the hot grill pan and cook, about 5 minutes per side. Finely chop the parsley and garlic and put it in a small bowl with the oil, salt, and pepper. Mix thoroughly. Place on individual plates and pour a little of the parsley sauce over each portion. Posted in Fish and tagged with Calamari alla Piastra, Grilled Calamari. RSS 2.0 feed.